New!! 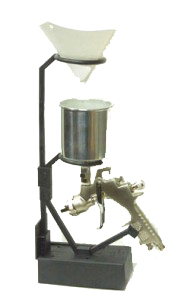 Ford #4 Economy Viscosity Cup for precise measurement of finish viscosity. Not for paints. Similar to cups shipped with Turbine systems like Fuji. Sold only in packs of 3. A Mil Gauge is necessary for measurement of wet finishes. Instructions for use are on the reverse of this metal gauge. Use for determining dry mil thickness. 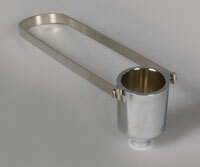 Universal Gravity Spray Gun Holder and filling station holds both gun and strainer (left) for easy filling and will swing out of the way once the cup is filled. 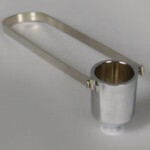 Can be used with or without mounting screws (supplied) on a flat surface so it’s mobile. Comes with holder for both mini and full sized gravity guns.